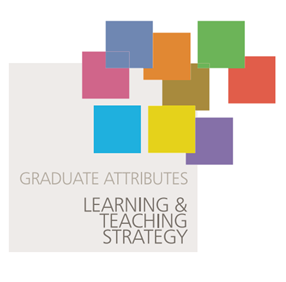 In this case study, Diana Strauss and Clare Wiseman, Senior Lecturers in Childhood Studies, explain how they have used learning technologies and other tools to ensure more efficient engagement of their Foundation Degree Childhood Studies students with the University Graduate Attributes, and have developed their students’ reflection on their graduate employability. The Foundation Degree Childhood Studies is a two-year work-based programme. Students attend University for either one day or one evening per week. The programme currently has 240 students, most of whom are returning to formal education later in life and have not followed the traditional route into higher education. to support their employability at graduate level. Previously, students had demonstrated fleeting engagement with the seven University Graduate Attributes (previously Graduate Skills). Therefore, the team recognised that there was a need to create a more interactive, contemporary and permanent tool for students to engage with the GAs over the period of their studies. In consultation with the Faculty Learning Technologist, it was decided that the software that would best meet these requirements was PebblePad. Diana and Clare then worked together with their learning technologist to create a digital workbook in PebblePad. to support students in creating a portfolio of personal and professional development, with longevity and currency in terms of future career development and employment opportunities. The workbook was piloted with one cohort of students in 2017-2018 and the outcomes of this pilot and consultation with colleagues enabled us to further develop it to provide a ‘glossary of terms’. Initial feedback from the pilot workbook had highlighted the problematic nature of some of the terminology used to describe the seven GAs, such as ‘environmental stewardship’; ‘ethical considerations’; ‘digitally literate’. In order to promote co-construction of knowledge and to develop students as partners in learning, a Padlet on the module Blackboard was created to encourage students to offer their interpretations of the meanings of some of the terminology to enable us to develop the ‘glossary of terms’. The digital workbook has been implemented with all new Level 4 students (8 cohorts) joining the programme in September 2018. The Workbook was assessed on a ‘Pass or Fail’ basis, as it was felt that grading of students’ personal reflections was inappropriate. Two key criteria were applied to the assessment: Presentation and Engagement. ‘ Presentation’ focussed on the organisation, planning and full completion of the workbook and ‘Engagement’ focussed on the depth of reflective responses and the use and application of learning resources to support the response (a copy of the detailed assessment criteria is available). Module Evaluations demonstrate that students enjoyed the opportunity to: reflect on and consider their own working practices and how these could be improved; develop some specific IT skills (Digital Literacy). Students commented that they could easily see the links between the GAs of ‘professionalism’, ‘innovation’ and ‘communication’ and their personal and professional identity. On the design and accessibility of the workbook, students commented that the layout of the on-line Workbook Portfolio is user friendly and easy to navigate and is easily accessible in different settings. The use of Padlet to encourage students’ comments and explanations of some of the terms in the glossary was also seen as helpful. The Module Evaluations provided feedback on aspects of the module and workbook that the students found problematic. These mostly related to the fact that seven Graduate Attributes are too much to work through in a space of six weeks and that there was not, in fact, enough time to ‘digest’ the meaning of each attribute before having to reflect, provide evidence of reflection and plan development. Another issue raised related to the layout and structure of the workbook: it was repetitive in places and only one page can be viewed at any time. Six members of the team (including two Partnership tutors) were involved in delivering the PPPD module and launching the workbook. In order to support the staff members, Diana set up an email collaboration group where specific observations, comments, suggestions and advice could be shared in ‘real time’ as the workbook was being implemented and used by the students. This informal ‘community of practice’ not only provided excellent opportunities for collaborative working, but also the opportunity to share good practice and develop new ideas. Tutors specifically supported each other in understanding different types of ‘evidence’ that may be uploaded by students into the workbook. The team members collaborated to assess the workbooks and moderate feedback comments. This was also edifying practice, allowing tutors to develop and share their own understanding of the Graduate Attributes. 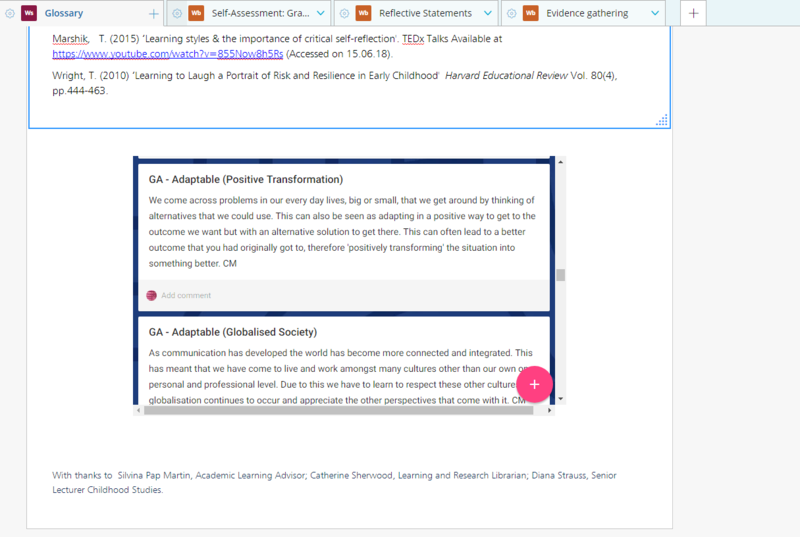 Furthermore, the Atlas platform allowed tutors to engage in ‘virtual’ collaborative marking and they appreciated the efficacy of the ‘Atlas’ feedback tool in PebblePad. To consider how the GAs can be explored upon over a longer period of time; this may mean that students engage with four of the GAs in Year One and then look at the remaining three in Year Two. This will need a further discussion and a decision as to which GAs are most appropriate to be explored initially and which three could be visited at a later date. The layout and structure of the workbook as a PebblePad tool can be adjusted so that it is more easily navigable and there are fewer text boxes that may require similar input. Consideration of how PebblePad may be incorporated as an aid to assessment practices in other modules on the programme.